31st floor - 1 bedroom condo. Living room - spacious and stylish living with a Queen sofa sleeper. 31st floor - 1 bedroom condo. Enjoy the views of Diamond Head and the ocean from your own private balcony (Lanai). Darmic Waikiki Banyan: Tower 1 3109 in Honolulu. 31st floor - Tower 1 (Deluxe Ocean View)This tastefully appointed modern 1 bedroom condo offers stunning views of Diamond Head and the ocean. 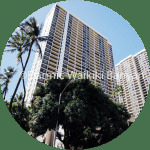 This tastefully appointed modern 1 bedroom condo offers stunning views of Diamond Head and the ocean. With the convenience of a separate bedroom, including a Queen and Twin Bed plus a Queen sofa sleeper in the living area. This is your home away from home, with all the comforts – including the convenience of a fully equipped spacious modern kitchen (saving you money and time on your holiday), with plenty of cupboard space and a dishwasher. Aloha… and welcome to Darmic Waikiki Banyan!Darmic is a family owned company and is the only New Zealand owned company operating out of the Waikiki Banyan.